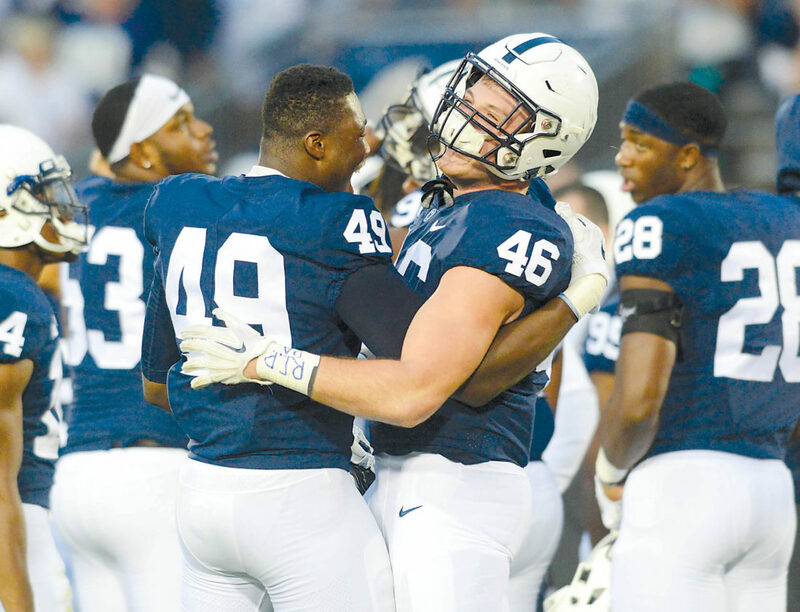 09/01/18 Patrick Waksmunski / Appalachian v Penn State / Penn State defensive end Daniel Joseph (49) and defensive end Nick Tarburton (46) celebrate the OT win. UNIVERSITY PARK — Teams like Appalachian State make sports fun. And unpredictably zany. Eleven years to the day after pulling off one of the biggest upsets in college football history, a 34-32 stunner at No. 5 Michigan, the small school from the mountains of Boone, N.C., nearly shocked the football world again Saturday. The Mountaineers, 24-point underdogs, probably had every sports fan in the country, aside from those in the Nittany Nation, rooting for them. 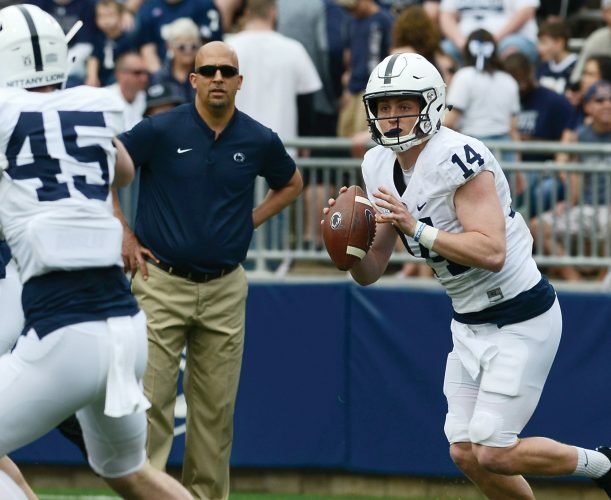 They nearly pulled off another monumental upset that would have dealt a devastating blow to Penn State’s hopes for the season and given fodder to anyone out there who believes James Franklin just might be overrated. “They seem to do this against everybody,” Franklin said. But clock struck midnight on Cinderella in overtime, and Penn State managed to avoid what would have been a historically embarrassing loss. The No. 10 Nittany Lions blew a big lead, fell behind, needed a fourth-down conversion and last-minute touchdown just to get to overtime and then won it in the first extra session, 45-38, in the season opener before 105,232 fans at Beaver Stadium. After Miles Sanders scored for PSU in OT, cornerback Amani Oruwariye ended the game with an interception in the end zone to deny App State its upset. Anything can happen in college football, and something crazy almost happened to Penn State. App State overcame a 31-17 fourth-quarter deficit with three touchdowns in less than 6 minutes. The Mountaineers started shredding PSU’s defense, especially through the air with a quarterback making his first-career start, and stunned the Beaver Stadium crowd with the late comeback. The Mountaineers scored on a 24-yard TD pass from Zac Thomas to Malik Williams to close within 31-24 with 7:40 left. Then they caught PSU’s special teams napping with an onside kick, recovering at their own 47. A 39-yard pass to Corey Sutton put App State at the 1, and Jalin Moore scored on the next play. In a stunning turn of events, the game was tied at 31 with 6:03 left. Not to worry, though, right? Penn State has a dynamic offense led by Heisman Trophy candidate Trace McSorley, so surely he would save the day. McSorley did that eventually, but not before App State was able to put a huge scare into the Lions by taking a late lead. Penn State’s offense did nothing on back-to-back series, the latter ending at their own 6-yard line. The Lions punted, App State took over at the PSU 42 with 2:59 left, and the Mountaineers put themselves in position to pull off the upset. Moore, an NFL prospect who ran for 88 yards on 18 carries, scored on a tough 16-yard run up the middle with 1:47 left to put the visitors up, 38-31. “Nobody was putting their heads down on the sideline. Everybody was like, ‘Let’s go,'” Oruwariye said. KJ Hamler, playing his first college game, fielded the ensuing kickoff for Penn State a few yards into his own end zone. He was unsure of what to do, whether to kneel or run it out, and after taking a couple of steps, he decided to go for it. It looked like a terrible decision. But it turned out to be one of those, “No, no, no, STOP, no … go, go, YES, go” type of plays. Hamler found an opening along the right sideline and returned the kickoff 52 yards to the App State 48, where the Lions took over with 1:39 to play. Penn State stared down losing on fourth-and-2 from the 40. Franklin called a timeout to set up a play, and McSorley threw a pass to Brandon Polk that was a tad high, but the receiver went up and got it for a 10-yard gain. McSorley found Juwan Johnson for 14 yards to the 16, and two plays later, he hit Hamler in the end zone for the tying score with 42 seconds to go. App State had enjoyed some success blitzing McSorley on some key plays in the second half, but on this all-out blitz, the quarterback just got the ball away for the score. “They were bringing all-out pressure, so we were able to kind of anticipate once we got that look,” McSorley said. App State still had time left in regulation to win the game, and was getting closer to doing so with a 30-yard pass to Sutton down to the PSU 45. The Mountaineers faced a moment of truth on fourth-and-4 from the 39 with 20 seconds left, having to decide to run a play trying to get a first down or kicking a long field goal. Coach Scott Satterfield had watched his offense move up and down the field the entire fourth quarter against PSU’s struggling defense, but he opted not to go for it on fourth down. Instead, Satterfield had Chandler Staton attempt a 56-yard field goal for the lead, and the kick was long enough but missed wide right. Typically in these type of games, the stronger team finds a way in overtime to get the job done against the smaller, upset-minded opponent. Especially at home. Penn State got the ball first, and Sanders ran right through App State’s defense. He went for 6 yards, then 11 down to 8, then 4 more yards. Sanders then scored from 4 yards out for a 45-38 lead. “It was just a regular inside zone and make one cut and go, just for the win,” Sanders said. Sanders, making his first start replacing Saquon Barkley, finished with 91 yards and two TDs on 19 carries. 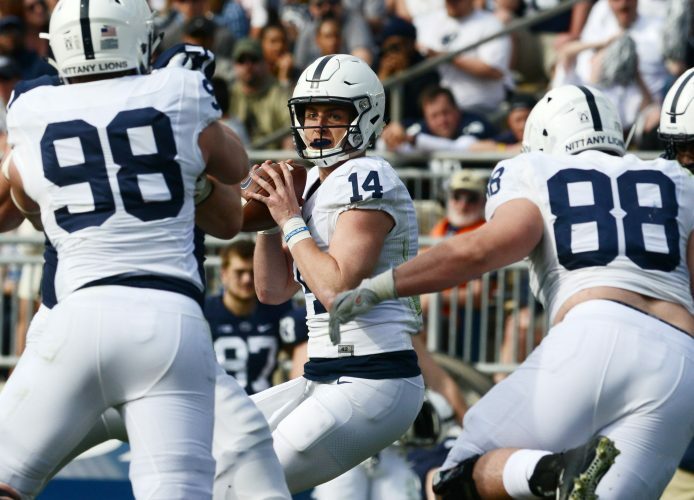 “(Sanders) was really able to come in and answer some questions that a lot of people had,” said McSorley, who completed 21-of-36 passes for 230 yards and one TD, while also rushing for 53 yards and two scores on 12 carries. Sanders also pointed out how the team never got nervous or felt like the game was slipping away, even when it was down late. App State converted a fourth-and-1 from the 16 on its overtime possession. But on the next play, Thomas threw to the end zone for Sutton, and when the ball was a bit high, Oruwariye went over the top and picked it off. Which he did. While also saving Penn State from a whole bunch of misery that would have come from a loss. “We got a ‘W,’ so that was real good relief,” Sanders said.